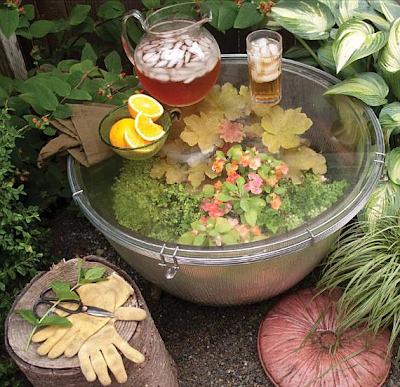 Here's an unusual large format terrarium, crafted by Seattle-based blogger and author Lorene Edwards Forkner. Lorene used an oversize industrial light bulb to house this planted arrangement. She selected plants that could handle a shady area and the terrarium/table is kept outdoors! See more of her lovely outdoor crafts in her book Handmade Garden Projects: Step-by-Step Instructions for Creative Garden Features, Containers, Lighting & More, or visit her blog plantedathome.com.